Many Americans ring in the new year with champagne and select it as their beverage of choice for special celebrations. Although Abraham Lincoln was not known to consume much alcohol, wines were often served at celebrations hosted by the President. One of the highlights of the current special exhibition in the Robert H. Smith Visitor Education Center, “My Abraham Lincoln,” is the wine list from Lincoln’s second inaugural ball. This small document lists several champagnes offered to Lincoln’s guests on this special occasion. The “Inauguration Ball” was held on March 6, 1865 in several galleries of the spacious U.S. Patent Office. It was the first time that an inaugural ball was held in a government building. The thousands of elegantly-attired guests enjoyed an elaborate buffet and had their choice of champagnes by De St. Marceaux & Co., Charles Heidsieck, or G.H. Mumm & Co., as well as “Old Sherry” and “Old Madeira”. Gentlemen were encouraged to have their appropriate payments ready when placing their beverage orders. Both “Carte Blanche” and “Carte Noire” varieties were offered by De St. Marceaux & Co. at $5.00 per quart and $3.00 per pint. 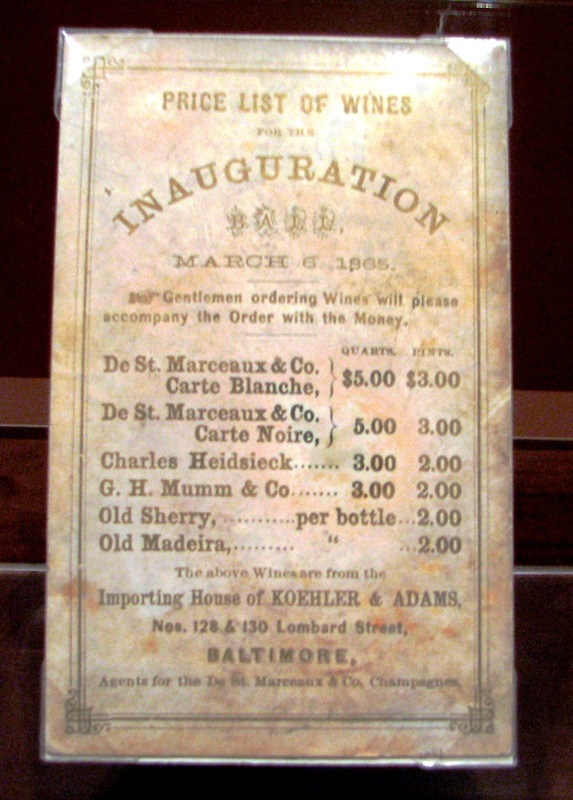 Charles Heidsieck and G. H. Mumm & Co. champagnes were less expensive choices at $3.00 per quart and $2.00 per pint. The well-established French firms of De St. Marceaux & Co, Charles Heidseick and G.H. Mumm & Co. began importing their champagnes to the United States in the 1800’s and found a ready market for their sparkling beverages. Although the Civil War presented unique challenges with payments and importation, particularly for “Champagne Charlie” Heidsieck, all of the firms thrived serving their American clientele. Americans continue to enjoy beverages produced by these firms today. These sparkling wines have proven to be very popular offerings at receptions and dinners at President Lincoln’s Cottage. Clients hosting events at this historic site often select historically-inspired menus, with food and beverages that were enjoyed or served by the 16th President. Period appropriate menu touches and beverages such as these help to make events at the site particularly memorable. Host your next champagne celebration at President Lincoln’s Cottage! The Events Department will work closely with you to plan and coordinate a unique and memorable event. Information about renting the site for a private or corporate event may be found at www.lincolncottage.org/events. A vôtre santé! Bonne Année! Ms. Bouterie manages private and corporate events at President Lincoln’s Cottage. Thank you for this little article, it is always fun and interesting to learn new things about one’s family. My wife actually bought me an old ad poster for the centennial of the champagne which we have hanging in our apartment.